While struggling to keep her wits and stay happy with her new grown-up job, Alex is juggling college courses, a new love interest, and keeping up with her close group of girlfriends. When her roommate and best friend Lila gets offered an opportunity to move to Los Angeles and sign with an agent, Alex realizes her life truly is changing, and everyone around her – including herself - is is growing up. Knowing she is faced with some hard decisions ahead, Alex struggles with keeping her job at Blissful. But does she really want to throw away what she dreamed of as a career – or will the secret-keeping for Kevin become too much to handle? 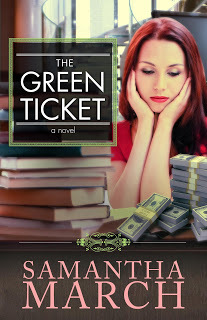 The Green Ticket is a story about morals versus money, and how one young woman navigates the shaky line between the two. I became immersed in The Green Ticket quickly, eager to find out what would happen to Alex. A novel about growing up quickly and discovering the person you want to be, with some fun and love along the way, The Green Ticket is an easy, fun read about growing into adulthood. Alex is a great character to root for. I wanted her to succeed, to come into her own, and to follow her dreams. I hated seeing anyone trying to thwart them, or upset her. Sometimes I just wanted to hug her, and she wasn't the only great character. I loved her circle of close friends. They're all so wonderful and supportive and many of the scenes of the five of them together made me laugh. I was completely transported back to my university days full of primping, parties, boys, and maybe some learning on the side. I really enjoyed her love interest, Harry. He comes across as genuine and real and nothing pleased me more than having her fall for a great guy! Her Besite and roommate, Lila, was such a fun character and their love and concern and support for each other came shining through. One thing I will say for Samantha's writing is that she has great stories that resonate and have great messages. Sometimes though, as I was reading, I seemed to crave some heavier hitting scenes and maybe to get out of Alex's head sometimes from having her describe things. I wanted to see them in a scene where they might have a bit more impact. Also, I might have liked to see some of the characters act a little 'out of character' to give them a bit more depth and dimension. Young Adult isn't entirely my genre, although I'll pick one up from time to time and overall, I enjoyed this coming of age tale and I'm sure anyone who regularly reads Young Adult will love The Green Ticket. Thanks so much for reading Lydia!